0 Comments Published by KL Ocs Kid on Thursday, January 7, 2010 at 5:17 AM. 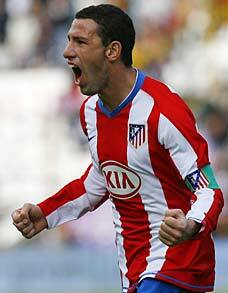 Argentina and Atletico Madrid’s Maxi Rodriguez is edging closer to an Anfield move. The player is keen to move to the Premier League in a bid to ensure he goes to the World Cup next summer. The sticking point has been over pay – with Liverpool’s coffers empty the player looks likely to take a significant pay cut to move to the reds. Most rumours seem to be that the player will arrive on a loan deal until the end of the season. The 29 year old can operate on the wing or as an attacking midfielder and in his 8 years spell in La Liga (at Espanyol and Atletico) he has scored 58 times in just under 250 appearances. He has been a peripheral figure for Atletico of late, although he did score 4 goals in the 6-0 win over Marbella in the Spanish Cup in November.